So says Antonio Neri in his groundbreaking 1612 book of glass recipes, L’Arte Vetraria. Elsewhere he warns in several places not to add “tartar” to any glass destined for yellow pigmentation. Tartar was a common additive to boost the ‘sparkle’ of a glass because it contained a high level of potassium carbonates. These converted to potassium oxide in the melt, which has a higher refractive index than the usual glass flux, sodium oxide. “Polverino” was a sodium based plant product used in many of Neri’s glass recipes, which he says was derived from the Kali plant grown in the Levant. The plot thickens when, for yellow, he recommends substituting ‘rocchetta’ another soda based Kali derivative. For Neri’s lead glass, he uses a different combination, this time pairing copper sulfate with iron oxide: “Take 16 pounds of cristallo frit and 16 pounds of lead calx. Mix them well and pass them through a sieve. To this material, add 6 ounces of thrice cooked copper, made with flakes of the kettle-smiths [chapter 28], and 2 pennyweight of iron crocus made with vinegar [chapter 17].” He goes on to advise, “If it leans toward greenishness, add a little iron crocus, which will remove the greenishness and will bring out a yellow color of the most beautiful gold. Yellow is one of several colors that iron oxide can form in glass, and is used frequently in low-fire pottery glazes. In that realm, it has a reputation as a difficult, unstable color, as Neri alludes to in his warnings. But in modern, higher temperature borosilicate glass, iron oxide is relied on for a nice yellow. In modern soda-lime glass, cadmium, titanium or the exotic praseodymium are more likely choices. They produced bright reliable color that is stable at the higher temperatures of modern operations. 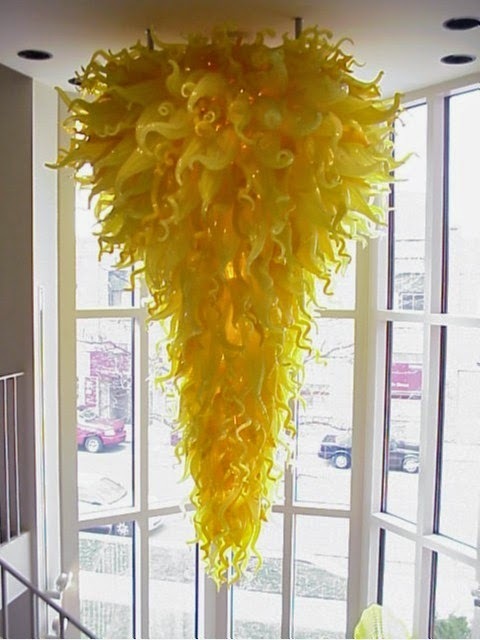 In lead glass, selenium is the modern favorite for yellow.